this is one of our favorite and most requested desserts that bill and i have perfected over many years. i mean: it is good. and easy. if you have a special occasion, try it. what? you don’t trust me? why are you here if you don’t trust me? i’ve talked before about cooking “cheats.” this recipe has two of them. this cake starts with a yellow cake mix. i don’t make it from scratch. i use betty crocker’s super moist yellow cake mixes. yup. it’s one of the few times you’ll see me use a cake mix for a cake. but this cake mix is really decent. tasty and moist. i use 4 of them in my 16” round cake pan. yup. you heard me. a 16” cake pan. 4 full mixes fills the pan enough to bake a cake that can be split into two layers. warning: this is NOT for the meek. it’s hard to split a cake this size. it’s probably better if you just make two regular size round cakes for the layers (one box each). start small. so that’s the cake part of the casada cake. the next part is easy, too. the strawberry filling is just strawberries, fresh OR frozen, mashed up to make a nice jam-y like filling. add a couple tablespoons of sugar to the fresh strawberries, along with a little water to help draw the juices come out of the strawbs. next my FAVORITE cheat. a fake butter-cream-y like cheater frosting. light and custardy at the same time. i start with instant vanilla pudding, add half the milk called for on the box, and then start folding in cool whip until it’s the consistency i’m looking for. i like a nice light consistency for the actual frosting. you might want a little denser consistency for the filling. it’s up to you. either way – it will be great. on the top of the bottom layer, place a nice thin layer of the frosting. spread some strawbs on top of that. the juicier the better. the juice will soak into the cakes. place the second layer on top. frost the whole cake with the rest of the frosting. 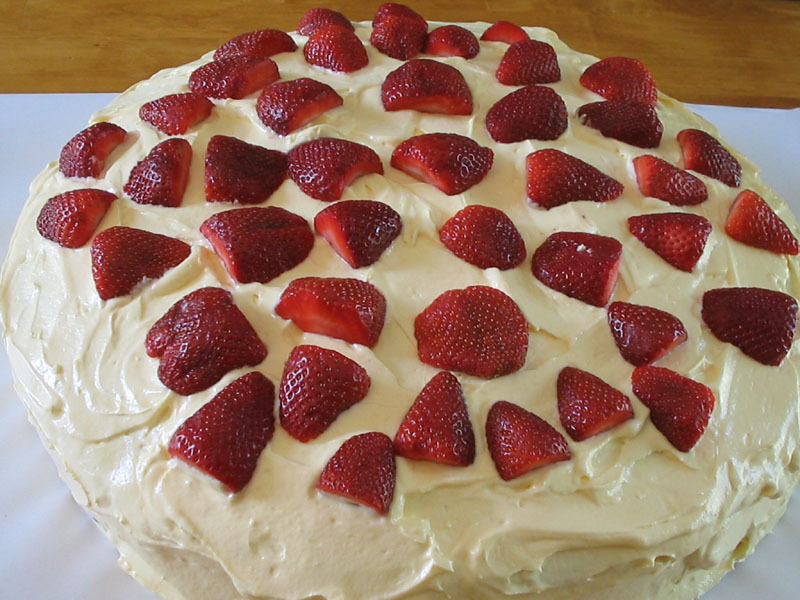 garnish the top of the cake with strawberries. on the cake i’ve shown here, bill started out trying to recreate stonehenge. the strawbs were not cooperating so he just started adding more to the cake. if you think you can do it prettier, go for it! i like this cake better than any casada cake i’ve ever had. you will, too. p.s. i’ve added a picture of the french toast casserole to my “food of the gods” entry. check that out, too. How many dozens of people could you feed with all that?